Wait, wait, wait! Before you turn your nose up and walk away from the word tofu, I totally want to have a little sit-down and chat for a second. I know what you may be thinking. I have heard it all and then some. And I’m all chowing down on my deliciously made tofu wondering what everyone is talking about. As a vegetarian, I have had to find other ways outside of cows, pigs, and chicken to get my protein. And there are a lot of other people who are lessening the amount of meat they consume. In doing so, you still have to be aware of how much protein you are getting on a daily basis. Along with quinoa, like we talked about last week, beans, and legumes, tofu is a wonderful option for your protein source. Tofu has a low calorie count, relatively large amounts of protein, and little fat. It is also high in iron, which can be something in great need for many vegetarians who become anemic, like I have been in the past. 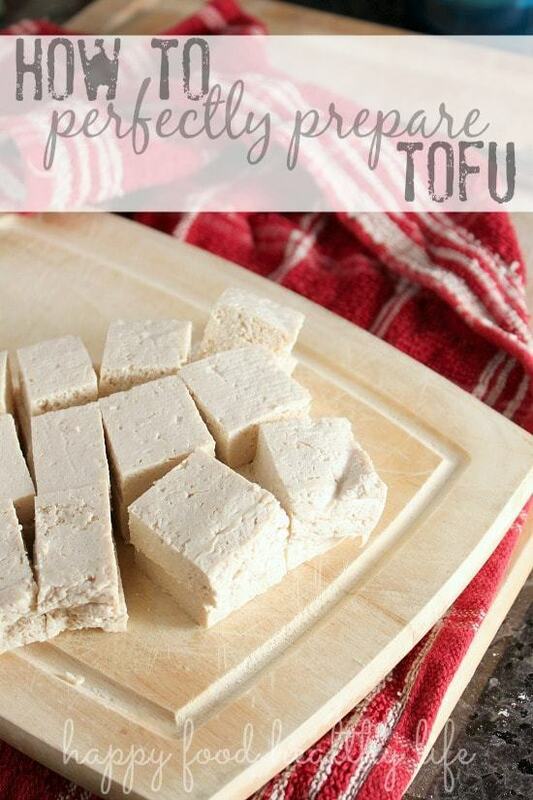 Tofu can also be a good source of calcium and magnesium. So what is tofu? It’s basically just soy milk that was coagulated and pressed. Easy peasy. And for the record, it has zero flavor. Really. And it’s not like we expect you to eat it plain. If that’s what you’re trying to do, then yeah, I could see how that would be pretty disgusting. Not sure I could do that either. Tofu is like a sponge. It is going to taste like whatever flavors you surround it with. One of my favorite things to do with tofu is to let it marinate in barbecue sauce for a few hours and then sear it on a pan. So delicious. What I wanted to discuss with you real quick is how to get your tofu ready to start cooking with. The thing with tofu is that there is a bit of preparation, but so much of it is hands off. You just have to plan ahead a couple of days. Oh, and just as a reference. If you are going to be cooking with tofu in a pan, on a grill, baked, in a savory-type of meal, you are ALWAYS going to want to buy the Extra Firm Tofu. I’m going to teach you how to make your tofu become as far from mushy as you can get it. And if you are using tofu in a dessert (yes, a dessert), where you are blending it down into a creamy-like texture, you will be using a silken tofu. Silken tofu is easy. There’s no prep needed. I will enter that world later this week. So let’s talk about what I do to prepare my tofu for adding to my favorite recipes like stir-fry, over rice, in salads, drenched in BBQ. The very first thing I do with my tofu when I bring it home from the store is throw it in the freezer. This step is key, in my opinion, to achieving more of a "tough" texture, as opposed to a mushy one. Let it get nice and frozen. I usually leave it in there for at least a full day. About 48 hours before you need to use the tofu, take it out of the freezer to begin thawing in the refrigerator. The frozen tofu takes quite awhile to thaw, so be sure to give it plenty of time. At least 2 hours (and up to 8) before you are planning on cooking with the tofu, it's time to work on pressing the water out of the tofu. There is such thing as a tofu press, but for some reason, I've never felt the need to be fancy. My way of pressing tofu may not be the most glamorous, but it works just fine, and I don't have to buy any extra equipment. Put a colander in an empty side of your sink. Open the package of tofu and dump all the water it's been sitting in. Place the tofu into the colander. Now you will start stacking things onto the tofu, distributing weight as equally as possible. I start with a plate or small cutting board. Then I put a few heavy cans or jars on top of the plate. 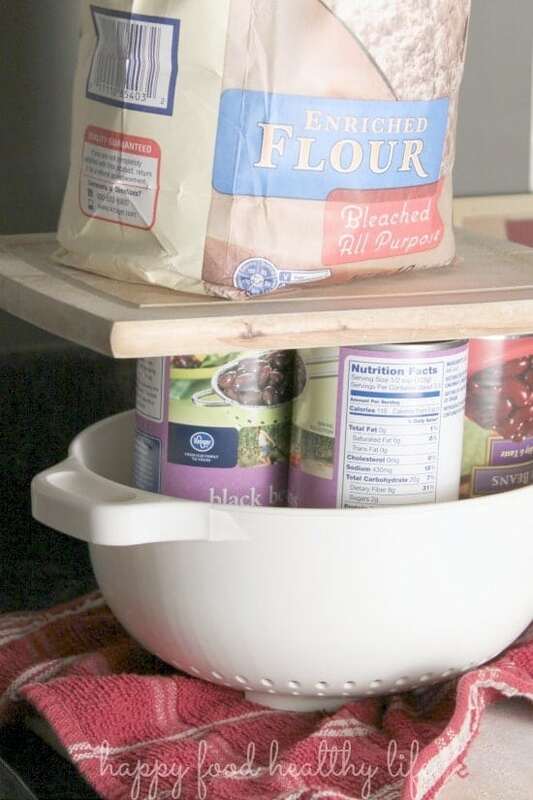 Then if you can keep the balance, place another dish on top of the cans and then maybe a sack of flour on top of that. This amount of weight will be perfect for pressing the water out. Let press for at least 2 hours. When you're ready to use it, you can cube it, slice it into filets, or crumble it up. If you're interested in marinating your tofu (yes, I know we JUST removed all the liquid from the tofu, but this method has never failed me), feel free to place cubed tofu in a plastic baggie and cover with any marinate you'd like. The longer you let it marinate, the more flavor will get into the tofu. I like to let it rest all day if I'm going the marinating route. No, it’s not fancy. It’s pretty wonky. But it works. 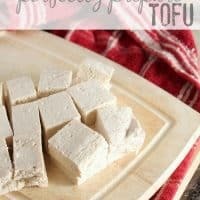 I have been using this method for preparing tofu for about 10 years and have had wonderful results. In the coming week, I look forward to sharing a super simple and versatile recipe that you are going to love. I will show you how I work with the marinade and sear up the tofu just perfectly to get that perfect mush-less bite of tofu. This will change the way you think about tofu. I promise! I have never prepared tofu and I’m a bit scared – doesn’t this method pus the tofu through the holes of the colander? Kristen, as long as you are using extra firm tofu and have frozen it first, it is generally firm enough that it won’t push through. Especially if you keep an even weight pressing down on it like a plate with cans on top. One weight in one concentrated spot on the tofu would probably be too much pressure in one place and possibly cause it to push through. But I’ve really never had that problem.